The Australian Cattle Dog (also known as the ‘Queensland Heeler’, ’Blue Heeler’, ‘Red Heeler’, or ‘Hall’s Heeler’) comes from Ireland—no, just kidding, Australia. When the wide open plains of Australia were opened for grazing in the early 19th century, the cattle were so active and unruly that the established lines of European herders weren’t up to the task. In 1840, a man named Thomas Hall crossed some blue merle Smooth Highland Collies with dingoes to create a breed known as the ‘Hall’s Heelers.’ These were crossed with the Bull Terrier in the 1870’s, making the breed more aggressive, and later with the Dalmatian for increased ‘carriage’ capability—the ability to run alongside horses. The Australian Cattle Dog’s distinct appearance and highly capable herding skills gained it notoriety across Australia. It was later imported to America and recognized by the American Kennel Club in 1980. An Australian Cattle Dog named Bluey lived from 1910 to 1939, giving it the Guinness World Record for longest canine life span. The Australian Cattle Dog has a shoulder height of 43-51 cm (17-20 in) and weighs 12-18 kg (25-50 lbs). It is a fast, strong breed with powerful muscles and a distinct appearance from its dingo heritage. The Australian Cattle Dog has a broad head with dark brown, oval eyes, small, pricked ears, and a scissors bite. It has a low set tail which curves in slightly between the legs and is docked only in American pets. The Australian Cattle Dog is slightly longer than it is tall. The Australian Cattle Dog’s outer coat is weather resistant, short, and somewhat rough. The inner layer is short and thick. There are a variety of coat colors: red speckled (with possible dark markings on the head), or blue/blue mottled with possible markings of any color but black. Australian Cattle Dogs are born with a white coat which darkens increasingly over time. They shed once or twice a year. The Australian Cattle Dog is intelligent and willing to work. It is loyal and affectionate, and seldom barks. 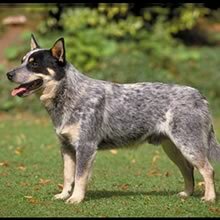 Bred to herd, Australian Cattle Dogs are very energetic and love to play. They can be stubborn and independent, but are highly obedient and attentive if properly exercised and socialized. The Australian Cattle Dog is intelligent and willing to work. It is loyal and affectionate, and seldom barks. Bred to herd, Australian Cattle Dogs are very energetic and love to play. They can be stubborn and independent, but are highly obedient and attentive if properly exercised and socialized. The Australian Cattle Dog makes an ideal companion for children and other dogs if adequately socialized when young (though it may nip at running children due to its herding instinct). Australian Cattle Dogs are wary of strangers. They make good guard dogs if trained. You can find Heeler puppies priced from $150 USD to $2500 USD with one of our credible breeders. Browse through our breeder's listings and find your perfect puppy at the perfect price. The Australian Cattle Dog makes an ideal companion for children and other dogs if adequately socialized when young (though it may nip at running children due to its herding instinct). Australian Cattle Dogs are wary of strangers. They make good guard dogs if trained. The Australian Cattle Dog requires only occasional grooming with a brush or comb to remove dead hairs. Musculoskeletal and reproductive ailments are common areas of concern. The Australian Cattle Dog is comfortable in warm and cool weather, but prefers to live indoors. Australian Cattle Dogs have a life span of 11-13 years and litters of 4-8 puppies. The Australian Cattle Dog is highly intelligent, making the training process simple. It is willing and able to learn a wide variety of tricks, and sports such as catch or Frisbee. Australian Cattle Dogs must be kept occupied with tasks and provided companionship or they will become destructive and mischievous. Constant exercise and activity are required to keep the Australian Cattle Dog happy. If you are unable to commit to this, this may not be the breed for you. The Australian Cattle Dog is definitely unsuited to apartment life. Heeler Puppies for Sale - Shipped Worldwide! Finding the right Heeler puppy can be dog gone hard work. PuppyFind® provides a convenient and efficient means of selecting and purchasing the perfect Heeler puppy (or Heeler puppies) from the comfort of your home, 24 hours a day, 7 days a week. Take advantage of our PuppySearch or leisurely browse our directory of hundreds of dog breeds, Heeler dog breeders, Heeler dogs for adoption, and Heeler puppy for sale listings with photos and detailed descriptions. Some Heeler puppies for sale may be shipped Worldwide and include crate and veterinarian checkup. Many Heeler dog breeders with puppies for sale also offer a health guarantee. With thousands of Heeler puppies for sale and hundreds of Heeler dog breeders, you're sure to find the perfect Heeler puppy.